Guinea pig don't have baby teeth that fall out to give way for adult teeth. Instead, your guinea pig has a set of teeth in the front and a set along his cheeks that are always growing. While they're not supposed to fall out, if they do, they'll grow back. Your guinea pig is born with the teeth he will have for his entire life. Because they're constantly growing, the guinea pig must wear them to a proper length by chewing. Nibbling on grass and other matter wears his teeth down so the front teeth come together with the top very slightly overlapping the bottom. Healthy teeth will not wear down to nubs. The teeth should be straight, close together and just the right length for your guinea pig to close his mouth and eat comfortably. It is not normal for a guinea pig to lose teeth; you should have him checked by the vet if he has any missing or loose teeth. If your guinea pig is not getting the right nutrition it is possible for his teeth to become loose or fall out. A lack of vitamin C can cause scurvy. In some cases your pig's teeth will become loose enough to wiggle with your finger. This is not normal for a healthy guinea pig. 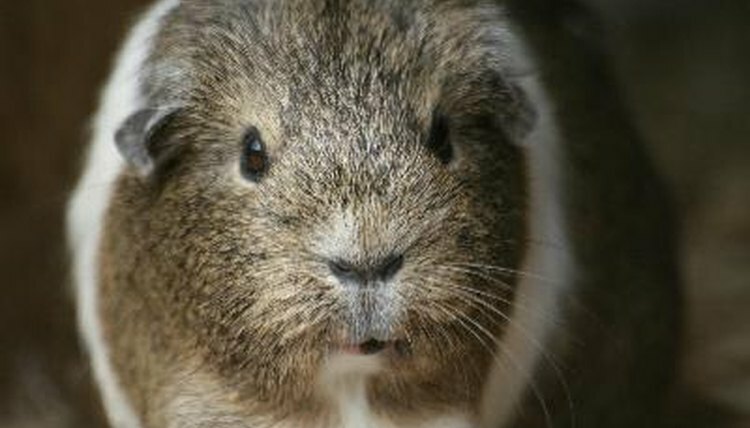 Loose teeth might move out of position, making it painful for your guinea pig to eat, or they could fall completely out, making it difficult for him to keep the rest of his teeth in alignment. Your guinea pig should get at least 90 milligrams of vitamin C every day. Bell peppers, oranges and parsley are good sources of vitamin C. Timothy hay is also high in vitamin C.
It is possible for your guinea pig to injure himself so badly that he breaks or loses a tooth. Chewing on materials that are too hard, pulling on cage wires or taking a hard fall can cause your pig's teeth to break. Poor diet can also make teeth weak and prone to breaking. If a tooth breaks below the gum line, a new one will grow in; it's important to keep the hole clean until then. Flush the hole with water every day to remove matter. Also, keep an eye on the newly unimpeded opposing teeth and make sure they don't grow so long they poke the exposed gums. Most guinea pig teeth will grow back without complications, but consult your vet any time you have a health concern and particularly if your pig appears to have any trouble eating. Genetic problems are rare, but they can cause a guinea pig to be born without all of his teeth or with teeth so weak that they break or move out of position easily. Tooth problems are usually apparent at an early age since they make it difficult for a pig to eat. While there is nothing you can do to change genetics, your vet can treat your guinea pig's teeth so he is able to eat comfortably. Do not allow a guinea pig with genetic tooth problems to breed since the problems may show up in the offspring.